Library’s annual celebration of volunteers, on the patio of the Dragon Rouge Restaurant July 19. 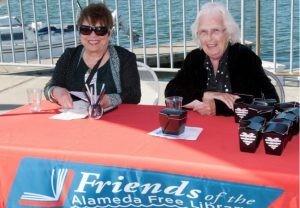 Volunteers for both the Friends of the Library and the Library itself were feted. Over 90 volunteers (of a total of 200) who support the library attended. ssing pride in the library and gratitude to the attendees, without whom the library’s value to the community would be greatly diminished. It was noted that so far this year the volunteers have logged over 4500 hours. the semiannual book sale, in Dewey’s Café, Live @ the Library concerts, the Docent Program lectures, the communications team, and the volunteers of the library itself. Gathering for group photos at the end of the event, these cohorts seemed to be all smiles. The Dragon Rouge’s Vietnamese offerings featured mango steak rolls, garlic chicken wings, tuna and shrimp egg rolls with peanut sauce, curried potato rolls and Vietnamese chicken sandwiches. The meal was accompanied by wines from Rock Wall Winery, and finished off with treats from goodie baskets put together by the organizing committee. Photographer Billy Reinschmiedt seemed to have little trouble inducing those smiles.